I sit watching the moon set over the Pacific waters. Clouds waft around the moon, catching its light. 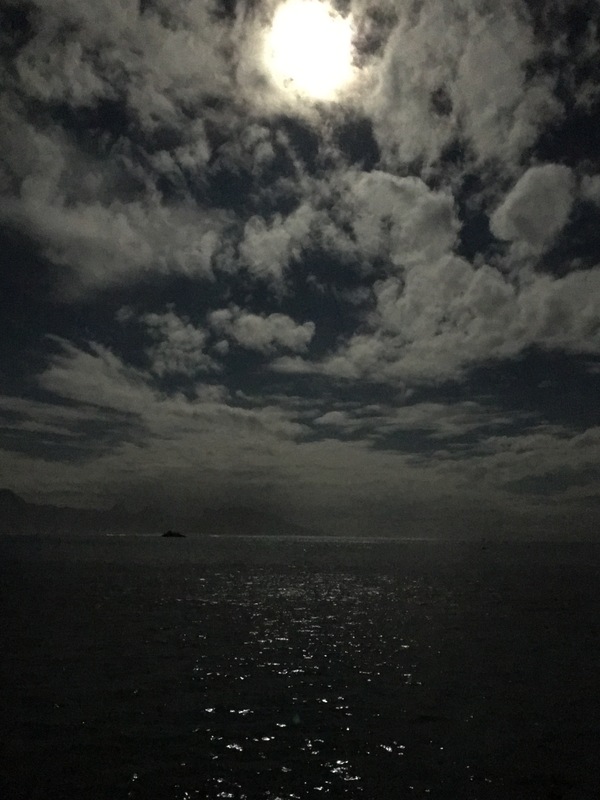 Moonlight dances in the clouds and over the waves—all is awash in its pacific glow. It is a moment of such profound peace and bliss. My words pale in the pale moon light, the moonlight being brighter than my pale words. And yet I want to write, to try to capture this moment. The moon has fascinated me since I was young, when I first saw it follow us as we drove down a dark country road. In my young heart it felt like a presence shining on me, following me, watching me when others might not be so attentive. I was with it and it with me, traveling the dark roads together. I saw this same moon set over the Saharan dunes. The desert breeze chilled my bones. The moonlight chilled my soul. But here over the Pacific the moonlight feels like a silken cloth, caressing the sea, the clouds, and your skin. … The clouds were denser than I thought. Or they have just gathered to embrace the setting moon. It has gone completely dark. Where once the moon’s light danced on the waves there is only darkness. I cannot image being here and not feeling the profound mystery of our existence. Caught between sky and sea, we are but a gossamer presence. But yet having “presence”, like the gossamer of a spider’s web that catches you up on your morning walk. A gossamer thin presence—yet strong and real. Wiithout the moon’s reflected light, who would know the clouds were there? So much would be missed and not seen but you captured them beautifully and just in time. Your top photo depicts a sky worthy of Turner. How he would love it! ( I love it too : Romanticism with a dash of Gothic ) .